The book is aimed at meteorologists, climatologists, and GIS practitioners interested in integrating weather and climate data into their GIS workflows. Redlands, California—Weather mapping goes beyond what's broadcast on the evening news. 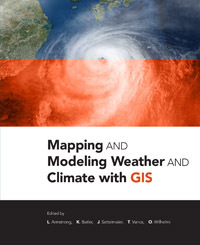 The new book Mapping and Modeling Weather and Climate with GIS, from Esri Press, describes how geographic information system (GIS) technology can be coupled with atmospheric and climate sciences data to do research. The book is aimed at meteorologists, climatologists, and GIS practitioners interested in integrating weather and climate data into their GIS workflows. Early chapters cover, for example, how modeled atmospheric data and weather radar can be used in ArcGIS technology from Esri. There's also a chapter on how weather- or climate-related social media feeds and posts—such as reports of debris from a tsunami—can be integrated into a GIS and used in research. A later chapter focuses on a GIS-based analysis of the EF5 tornado in Joplin, Missouri, in 2011. The chapter shows how combining weather, demographic, and weather-based web map services data helps answer such practical questions as, How many miles of roadways were in the tornado path? and Which roads likely need to have signs replaced, debris cleared, or lights repaired? There's also a five-chapter section on tools and resources such as Python scripting and the Weather and Climate Toolkit, free software from the National Oceanic and Atmospheric Administration (NOAA)’s National Climatic Data Center. The book was edited by Olga Wilhelmi, a geographer with the National Center for Atmospheric Research; Tiffany Vance, geographer with NOAA's Alaska Fisheries Science Center; Jack Settelmaier, a digital techniques meteorologist at the National Weather Service; Kevin Butler, a product engineer with Esri; and Lori Armstrong, Esri global atmospheric, climate, and weather industry manager. Mapping and Modeling Weather and Climate with GIS is available in print (ISBN: 9781589483767, 334 pages, US$49.99) or as an e-book (ISBN: 9781589484054, US$49.99). The book is available at online retailers worldwide, at esri.com/esripress, or by calling 1-800-447-9778. Outside the United States, visit esri.com/esripressorders for complete ordering options, or visit esri.com/distributors to contact your local Esri distributor. Interested retailers can contact Esri Press book distributor Ingram Publisher Services.